You can decide who you want to be, who you want to be tied to. Who you can trust. I never thought I’d be such a fan of werewolf and shapeshifter novels—but they’ve recently become some of my favorites. Patricia Briggs’ Mercy Thompson series (Amazon, Goodreads) is one to which I am hopelessly addicted, I enjoyed Maggie Stiefvater’s Wolves of Mercy Falls trilogy (Amazon, Goodreads) and consumed Rachel Vincent’s Shifters series (Amazon, Goodreads). There’s something captivating about stories of people who are not entirely people, that are connected to the animal world in a different way. And, when these novels are done well, the dynamics of “the pack” are absolutely compelling—typical family drama amplified. Jennifer Lynn Barnes’ Raised by Wolves is the first in her young adult werewolf series focusing on a human girl adopted by the Alpha of a werewolf pack after a rogue wolf killed her parents. At 15, Bronwyn Alessia St. Vincent Clare has only experienced the rigid life of the pack. Bryn has emblazoned in her mind a bloodbath of loss that not even the Alpha can erase: She hid while a rabid werewolf bit and killed her parents before searching desperately for his true query. Bryn herself. Later, Callum finds her hiding like a mouse curled under the sink. He adopts, saves and schools her in the ways of wolves. Rule one. No rational werewolf would bite a human. The ramifications are horrific. Yet it’s happened and continues happening. Everything in Bryn’s world changes when she finds Chase, a teenage boy locked in the basedment of the Alpha’s house. This sets Bryn on a path to discover the truth about the pack and the only world she’s ever known. They’re each other’s first and Pack second. Richly spliced with layers of a love story, myths and the traditional teenage struggle for independence, Bryn and Chase embark on an epic search for truth. Along the path of their journey, they begin to value their uniqueness and develop a love for one another. They team up with two teen werewolves in a quest to find and stop the rabid werewolf whose plot can destroy what they love—and their freedom and heritage. And then I heard him. Howling. Screaming. Fear – anger – desperation – No. …into a dream within a dream. A beautiful love story, myth and fairytale weave together finding truth and honor for both humans and werewolves. 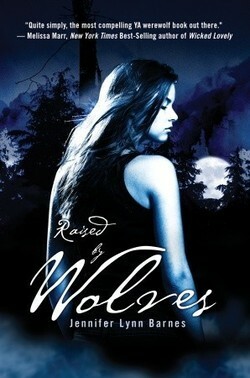 Raised by Wolves left me wanting to spend more time in Bryn and Chase’s world. Fortunately, there’s an already-published sequel (Goodreads, Amazon), and a third installment (Goodreads, Amazon) on the way!